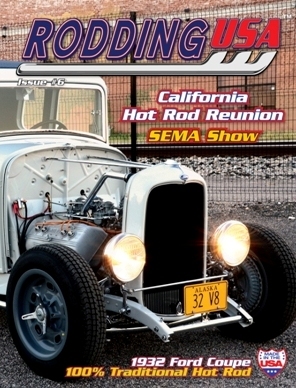 Rodding USA magazine's Issue #6 is sold out sorry. Issue #6 featured Bill Ewing's race car-inspired deuce coupe. From it's Ardun motor, sprint car steering and knock-off wheels plus quick-change rear it really makes a statement. You could say that: where sprint cars and hot rods meet you'll find Bill's coupe. We also feature Rudy Nollenberger's cute 1930 Ford Model A pickup. What draws you to this hot rod is Rudy's choice of wheels and unique hood while underneath it's powered by a very unusual motor! We've got more too with articles on Kenny Schell's deuce sedan, Jason Slover's 1934 Ford roadster Bob Penna's '31 Ford phaeton and Ron Eby's 1934 Ford coupe. We go behind the garage doors at Skip Roberts fabulous Rodding Digs and then check out Art and Shirley Goldstrom's auto collection. Want to know what they're building at Pete & Jakes?...we've got it covered! Event articles cover the SEMA show, California Hot Rod Reunion and Tucson Classics Car Show. We offer 22 handy tips for your garage plus we go to school with the slide rule in Hot Rod maths. Not forgetting our regular features, new products, news from around the industry, hot rod artists and the latest list of hot rod shops stocking the magazine. It's an excellent read, just click the Add to Cart button above to buy your copy.